A good notation has a subtlety and suggestiveness which at times make it almost seem like a live teacher. … a perfect notation would be a substitute for thought. In 'Introduction' by Bertrand Russell written for Ludwig Wittgenstein, Tractatus Logico-Philosophicus (1922), 17-18. As for those wingy mysteries in divinity, and airy subtleties in religion, which have unhinged the brains of better heads, they never stretched the pia mater of mine: methinks there be not impossibilities enough in Religion for an active faith. In T. Chapman (ed. ), Religio Medici (1643, 1831), part 1, sect. 9, 17. 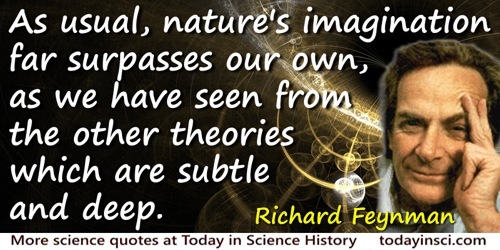 As usual, nature’s imagination far surpasses our own, as we have seen from the other theories which are subtle and deep. In The Character of Physical Law (1965, 2001), 162. Do you remember what Darwin says about music? He claims that the power of producing and appreciating it existed among the human race long before the power of speech was arrived at. Perhaps that is why we are so subtly influenced by it. There are vague memories in our souls of those misty centuries when the world was in its childhood. Spoken by character, Sherlock Holmes, in A Study in Scarlet (1887), Chap. 5. Collected in Works of Arthur Conan Doyle (1902), Vol. 11, 68-69. Every so often, you have to unlearn what you thought you already knew, and replace it by something more subtle. In Terry Pratchett, Ian Stewart and Jack Cohen, The Science of Discworld (2014), 44. I do hate sums. There is no greater mistake than to call arithmetic an exact science. There are permutations and aberrations discernible to minds entirely noble like mine; subtle variations which ordinary accountants fail to discover; hidden laws of number which it requires a mind like mine to perceive. For instance, if you add a sum from the bottom up, and then from the top down, the result is always different. Again if you multiply a number by another number before you have had your tea, and then again after, the product will be different. It is also remarkable that the Post-tea product is more likely to agree with other people’s calculations than the Pre-tea result. Letter to Mrs Arthur Severn (Jul 1878), collected in The Letters of a Noble Woman (Mrs. La Touche of Harristown) (1908), 50. Also in 'Gleanings Far and Near', Mathematical Gazette (May 1924), 12, 95. Intelligence is an extremely subtle concept. It’s a kind of understanding that flourishes if it’s combined with a good memory, but exists anyway even in the absence of good memory. It’s the ability to draw consequences from causes, to make correct inferences, to foresee what might be the result, to work out logical problems, to be reasonable, rational, to have the ability to understand the solution from perhaps insufficient information. You know when a person is intelligent, but you can be easily fooled if you are not yourself intelligent. In Irv Broughton (ed. ), The Writer's Mind: Interviews with American Authors (1990), Vol. 2, 57. Our world will yet grow so subtle that it will be as ludicrous to believe in a god as it is today to believe in ghosts. Aphorism 57 in Notebook D (1773-1775), as translated by R.J. Hollingdale in Aphorisms (1990). Reprinted as The Waste Books (2000), 52. The mathematician starts with a few propositions, the proof of which is so obvious that they are called self-evident, and the rest of his work consists of subtle deductions from them. The teaching of languages, at any rate as ordinarily practised, is of the same general nature authority and tradition furnish the data, and the mental operations are deductive. In 'Scientific Education: Notes of an After-Dinner Speech' (Delivered to Liverpool Philomathic Society, Apr 1869), published in Macmillan’s Magazine (Jun 1869), 20, No. 116, 177. Collected in Lay Sermons, Addresses, and Reviews (1871), Chap 4, 66. The soul seems to be a very tenuous substance … [and] seems to be made of a most subtle texture, extremely mobile or active corpuscles, not unlike those of flame or heat; indeed, whether they are spherical, as the authors of atoms propound, or pyramidical as Plato thought, or some other form, they seem from their own motion and penetration through bodies to create the heat which is in the animal. As quoted in Margaret J. Osler and Paul Lawrence Farber (eds. ), Religion, Science, and Worldview: Essays in Honor of Richard S. Westfall (2002), 169. There remains something subtle, intangible and inexplicable. Veneration for this force beyond anything that we can comprehend is my religion. To create a human through genetic engineering that is more complex, more refined, more subtle, farther from animals, than the ones we have today. The Genes of Hope. In Marc J. Madou, Fundamentals of Microfabrication: the Science of Miniaturization (2nd ed., 2002), 467. You have chosen the most fascinating and dynamic profession there is, a profession with the highest potential for greatness, since the physician’s daily work is wrapped up in the subtle web of history. Your labors are linked with those of your colleagues who preceded you in history, and those who are now working all over the world. It is this spiritual unity with our colleagues of all periods and all countries that has made medicine so universal and eternal. For this reason we must study and try to imitate the lives of the “Great Doctors” of history.